Far to the North, an ancient Titan formed by a powerful energy lives beneath the world's substrata. Having the knowledge of the darkness that lies in the hearts of beings it wanted to protect itself from potential attacks and selfish exploitation. 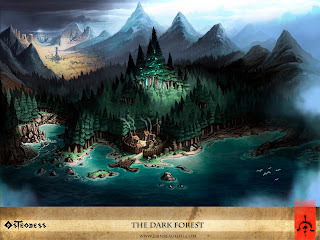 So, it twisted the woods above into a gnarled fortress of iron-like trees blocking out the sun and created a brutal gauntlet for any would-be adventurer or plundering army seeking its power. There it lived, secure, for thousands of years until one year, just off the Southern coast, a ship found itself crashed on the edge of the dark forest in the viridian waters of the untouched cove there. Instead of advancing the harsh forest on to eradicate the unwelcome guests in fear, the Titan chose to leave them to struggle and die against the harsh, narrow strip of land that existed outside the twisted woods, judging the people too insignificant to be a threat. Surely they could not survive for long. To the creature's surprise the people proved resilient and carved out a life at the woods edge and were grateful for its shelter and meager bounty. They felt the energy contained within the earth that he provided and began to worship it in their own small, humble ways. The creature had never seen mankind show such love, appreciation and community before now and it grew fond and curious of the village. As it began to spend more and more time observing them, it found that it welcomed the company they provided. The Substrata creature began to care for them as its own, from a safe hidden distance, and would later come forth in a brazen move to pluck a chosen soul for salvation. 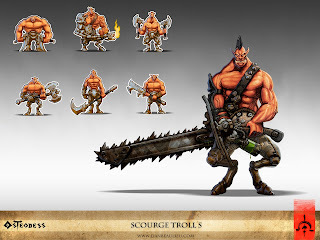 A salvation, as it would turn out, for all of them, for in the Eastern dry plains an army was building and preparing to decimate the forest and destroy the power it protects. The Substrata creature came to know a particular teenage girl from the village more than any, the inquisitive daughter of a herbalist. While soft and kind, she was also adventurous and more brave than most. She would venture deep into the forest, despite its perils, to study the plants and animals without fear. This was the ancient being's kingdom and though he was angered at her intrusion at first, he quickly realized she was no threat and he was fascinated by her uniqueness. Though he loved and protected the villagers he always did so quietly from a distance. However, the young girl became ill beyond medicine's reach due to curiosity gone wrong experimenting with plants in his forest one day. 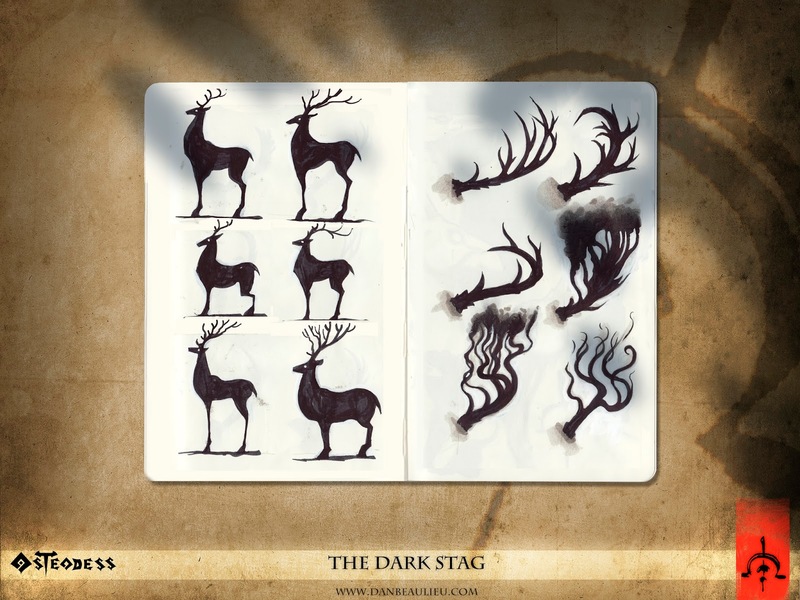 As the girl lay dying in her mother's arms at the forest's edge, a dark stag with horns of swirling smoke emerged boldy from the woods and stood looking down at them. Though he spoke no words, the townspeople heard his message to the mother as the smoke wound its way to their ears on the wind in a whisper, "I can save your daughter from death but she must become a creature of the forest and never remember you as mother. She will become the forest's greatest guardian and your savior. Decide now, quickly." 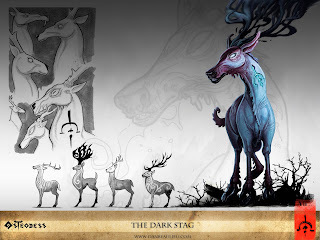 Wanting nothing more than for her daughter to live the mother laid her daughter's limp body over the stag's back, kissed her gently goodbye and let the Stag take her girl deep into the woods. He took her deeper into the forest than any man had ever tread, deep, until they reached a massive stone altar at the forest's very core. 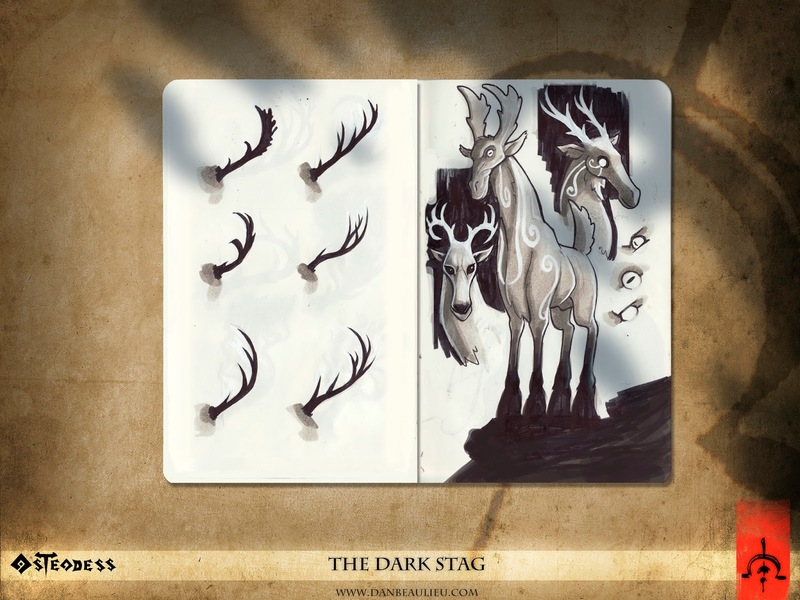 The girl's metamorphosis took an excruciating number of days as her human soul and the Dark Stag's spirit energy bound together as one. When the transition was complete she had no memory of her former life and was left with a body that was a union of her human skin and the plant elements she loved and studied. She had truly become one with the forest. 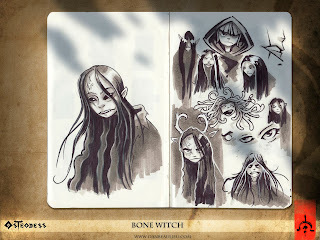 Known now as the Osteodess, or "Bone Witch", she is the pupil of the Dark Stag. Using the forest's dark magic she walks the woods looking for anyone wishing to harm the mighty being below. 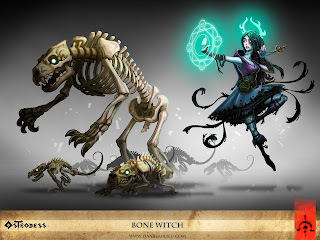 One of the Bone Witch's greatest spells is a sort of necromancy. 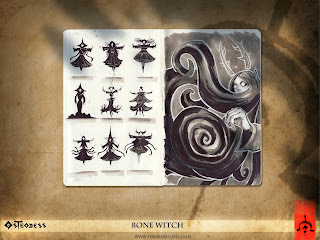 She summons the long dead creatures from the forest floor and can create armies of skeletons to come to her aid. 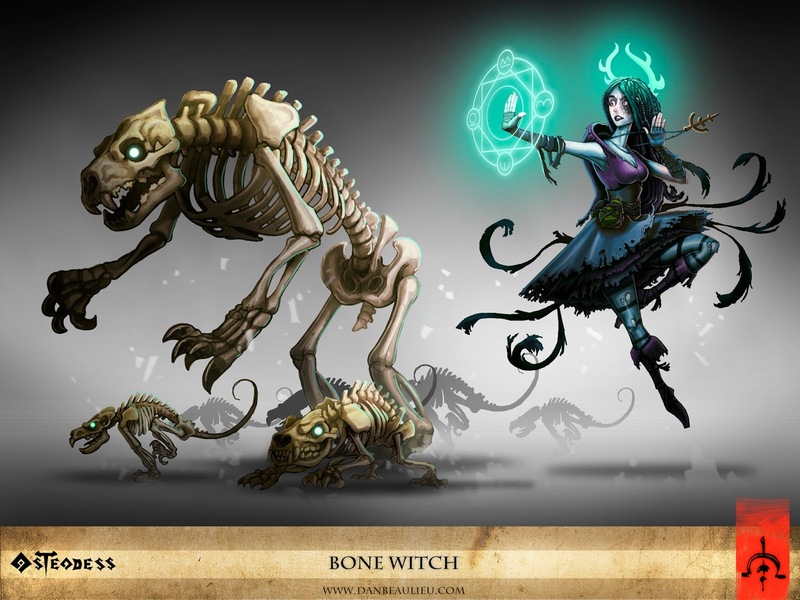 The more her knowledge and power of magic grows the deeper she can dig into the earth for her soldiers and bring massive creatures from the past to life. The Dark Stag is the physical form of the Substrata in the world. He came to be when the Substrata realized she was dying and he knew he had to save her so he animated into a recently dead stag from nearby. 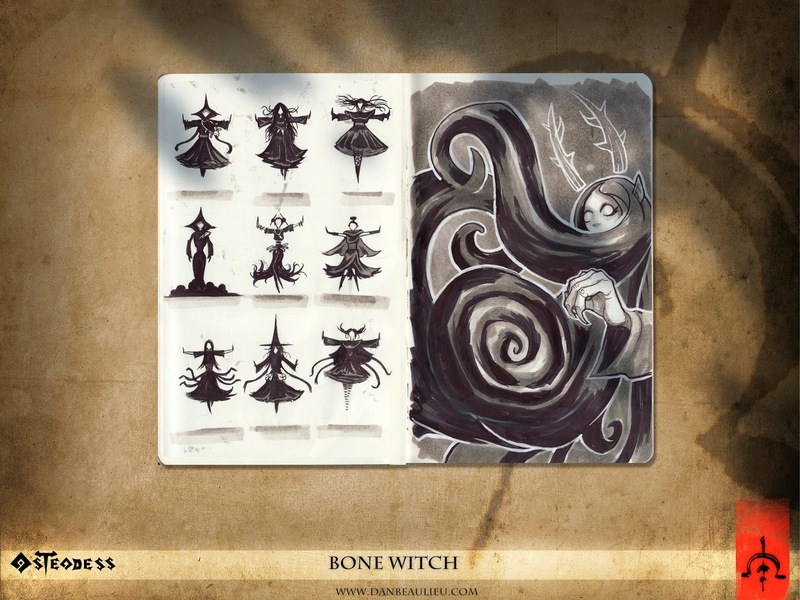 He is teacher of the dark arts and the wisdom of the dark forest to the Osteodess (Bone Witch) and, her protector as she grows in strength. They are bound to each other and side by side they are the guardians of the forest. 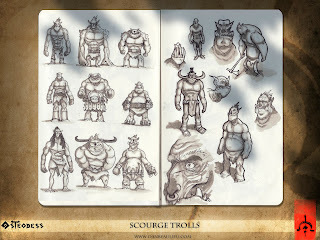 Little is known of their origin but, they are a savage race of giant creatures that have been grafted with machines by some unthinkable evil oppressor. Drunk with their unnatural power they march, destroy and pillage under the orders of their unknown master from deep in the arid East mountains. They have now amassed at the edge of the forest, preparing to destroy it and all that lives there without mercy. back at life drawing !